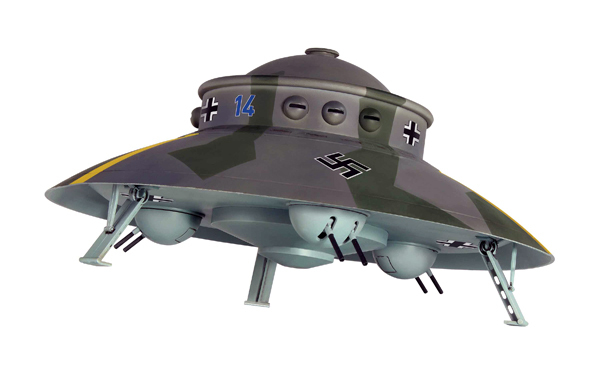 Haunebu - Nazi "Flying Saucer"
In an attempt to create the world's leading military, Hitler tasked Germany's most innovative engineers with developing a series of cutting-edge, often bizarre aircraft — many of which never made it past the drawing board. And, according to some, the Third Reich's scientific capabilities were so progressive that they began work on a series of secretive spacecraft. Known as "Haunebu," these flying saucers were built upon specialized engines and, again according to some theorists, they remain in underground bases around the world. Representing one of these otherworldly ships, this 1/72 scale model — an exciting collectible in the acclaimed Luft-X series — features an advanced circular design, three undercarriage ball turrets, and authentic German markings. Measures approximately 8" in diameter.